We’ve included 15 sample pages in our nifty flip book sample so you can see what you’ll get. Monthly pages help you plan your month, keep track of dates, and review what worked and what didn’t. Some spaces have headings, others are blank so that you can personalise your Journal according to what you need. 52 weekly spreads organise you day-to-day, with flexible, untitled spaces. You decide what goes where. Blank ‘adventure’ pages are there for, well, adventures. You choose how you’ll use them. What else? Bible colouring, of course. Some of the prettiest colouring page art you’ll see. An index, to keep track of what you put where, plus ideas on how to use your adventure pages. We’ll give you printable numbers and headers to cut and stick in case you love our typeface better than your handwriting. Plus, we’ll give you the absolutely gorgeous back cover as a printable to colour. We sold out the first print run. We’ve got more, but be quick… you don’t want to miss out. 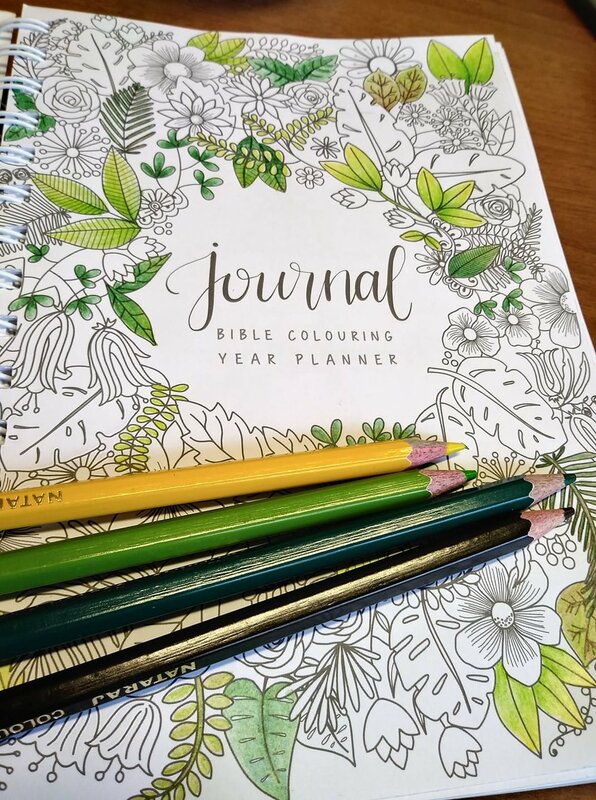 Our Journal and Year Planner features beautiful Bible colouring designs, monthly planning pages, weekly spreads and blank ‘adventure’ pages. If you’re a non-Aussie, we apologise. We live on the other side of the world from most people and postage costs from us to anywhere are astronomical. That’s why we’ve put together a version of our Journal that is Print On Demand (POD). You order, a company called lulu.com prints your order and then they ship it using local postage. I’ve ordered my journals. When will they arrive? 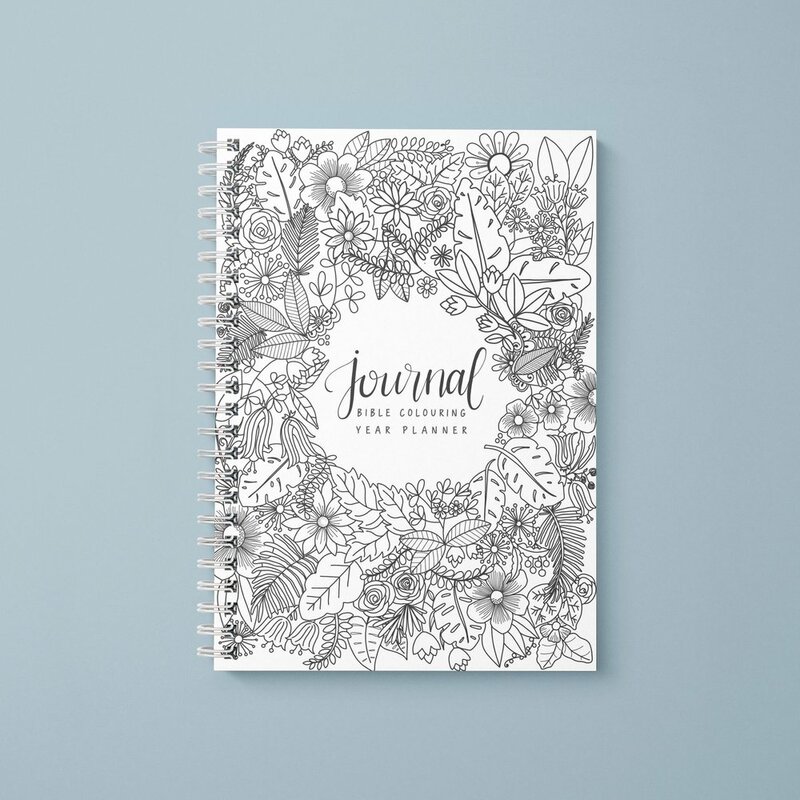 You should see your beautiful Journals about a week after ordering if they are being posted within Australia. If you’re overseas… most parcels travel by plane these days, so it shouldn’t be too much longer. If yours hasn’t turned up, let us know and we’ll track it for you. Why aren’t there dates in this journal? Don’t all planners have dates in them? We debated long and hard about this, and consulted with lots of our colouring community as to the best thing to do. Sure, having dates already included in the planner is convenient, but it’s also inflexible. If you stop using it for a period for some reason, it’s quickly obsolete. An undated journal can be stopped, started and picked up again by its owner. You could start using it this November, when you get it. An undated journal can be given as a gift: your friend might already have a planner figured out for next year, but she could put this one aside for the following year. Dated journals that don’t sell mostly end up in landfill. At best, they get shredded for recycling. As Christians, we want to be good stewards of our resources and be as environmentally friendly as possible. Allowing our colourers to write in their own dates seems the best way to avoid needless waste. Again, consultation with our colouring community won out here. More people said spiral was their preferred binding option. They liked to be able to fold back the pages without ruining the book. It’s true that spiral binding makes the journal a little more expensive, but we think it’s worth it. My handwriting isn’t very nice. When I write in the dates, will I ruin the look? First, we suggest using a pencil to get your dates into the Journal. If you make a mistake, it’ll be easier to correct. Second, if you really, really don’t want to write them in, you can get gorgeous date stickers at craft and office supplies shops these days. Here’s a little example of one. There are lots more. Do I get to colour in the gorgeous cover? If you can find Sharpie-style pens that will colour on gloss card, yes, you can colour the cover. Otherwise, you’ll have to stick to colouring it on the first inside page, sorry. We had to make the covers of the journal sturdy and durable, which means a gloss coating. We want our journals to last the full year. Will I be able to photocopy the Bible colouring pages in the Journal? Please don’t photocopy any of our Bible colouring designs! It’s true that in some of our previous books we’ve offered free downloads of the Bible colouring designs so that you can reprint them for personal use. In this instance, however, we’d ask that you head to our shop and purchase the printable download file for the design you like. However, you will get a beautiful freebie printable with your Journal: the full design of the florals and leaves from the front and back cover.